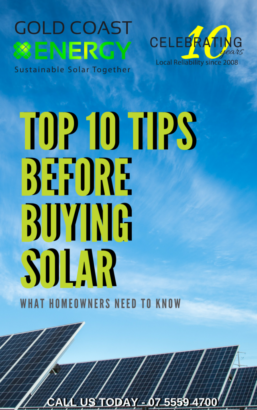 During recent health check audits of Gold Coasters that had their systems installed during the initial boom (about 3 years ago), Gold Coast Energy inspectors have been noticing alarming rates of solar panels turning yellow. 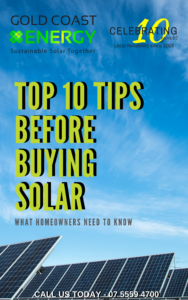 In particular this phenomenon is most noticeable in the 1KW systems with cheap Chinese panels where the homeowners got their system for either free (in exchange for signing over the $8,000.00 rebate at the time) or a very small out of pocket charge. Now Solar panels should not turn yellow, no matter how long they have been exposed to the weather. If your panels are, chances are that this is drastically cutting the performance of your system and you should be contacting the company that you purchased the system off to make a claim on the panels 5 year manufacturer’s warranty. This yellowing colour of panels is a common occurrence for many panels that have been installed in Australia. The panels that are turning yellow – or in some cases are yellow when pulled out of the box from the manufacturer are panels with brand names that you will not recognise, who are manufacturing panels simply to fill the high demand at a low price. 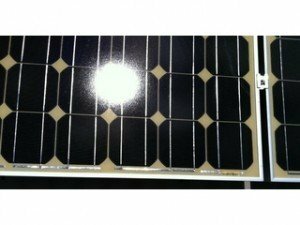 There is an EVA (Ethylene-vinyl acetate) component in solar power panels which is required to be baked at a certain temperature for a set period of time to ensure that the EVA sets properly. Consider an oven on an industrial level to do this baking, this becomes a high cost in the manufacturing process due to the amount of electricity required to power the oven. The reason these panels are starting to turn yellow, is due to the panel not being at the correct temperature when being baked and not being baked for the required length of time and thereby not being sealed properly. These shortcuts in production allows more panels to be pumped through the oven, lowering the cost per panel of electricity required, therefore lowering the cost of the panel so it can be sold for a cheaper price in the Australian market. This is how you then get yellowing panels. This is an issue for thousands of panels across Australia, and it is simply because of the manufacturers cutting corners in the manufacturing process, to make a lower cost panel. This is having a massive impact on home owners who have purchased panels that are subjected to this yellowing. Claiming warranties from factories in China is a very hard process. The first point of call is always the company that you purchased the system off as they should have a warranty process in place with their supplier. Gold Coast Energy has advanced panel testing equipment that can tell you if your panels are under-performing.